Acute chest pain is a sudden onset or particularly painful. It can range from cardiac chest pain or heart attack to a torn muscle or bruised rib. If you suspect cardiac chest pain then seek urgent medical attention immediately. Do not take chances. Many cases of acute chest pain have musculoskeletal causes, for example, from a hard impact to the rib cage. Cardiac chest pain is rare, however, it should always be considered with symptoms of acute chest pain where the cause is not obvious. Chest pain could originate from the muscles, but it could also signify a more serious cardiac problem, even in young athletes. Read more about Cardiac chest pain. A rib fracture is common in contact sports and usually occurs following a hard impact to the chest by an elbow or similar. Breathing will often be painful and there will normally be a particular point on the ribs that will be especially tender. It is possible that the fracture may cause internal damage so seeking medical advice is recommended, especially if the pain is severe. A rib contusion will have similar symptoms but is unlikely to last as long as a fracture. 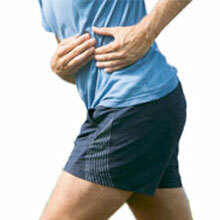 Read more on rib injuries. Spinal manipulation to restore full range of movement to the joints in the spine. Stretching and strengthening exercises may also be recommended for the upper body, upper back and core to regain full movement and strength. The collarbone connects to the sternum or breastbone in the middle of the chest at the top. If the shoulder is subjected to a hard impact, this joint (known as the sternoclavicular joint), can become injured. There will be pain located on the joint which may spread into the shoulder. Medical help should be consulted to check there is no further damage to blood vessels in the area. Symptoms will include pain when pressing in specifically at the sternoclavicular joint where the collarbone meets the sternum. Pain may radiate into the shoulder and it is likely there will be a visible bony lump over the joint. The cause of a stitch is not known and there are several theories doing the rounds. These include eating too close to exercise, a cramp in the diaphragm due to a decrease in blood flow, not warming up thoroughly. It is also suggested the liver tugs on the ligaments which connect the liver to the diaphragm. In order to relieve stitch pain, try stopping, leaning forwards and breathing out hard whilst pressing into the painful area with your fingers. Costochondritis is an inflammatory condition that occurs at the joints between the ribs and the sternum (breastbone). The condition is sometimes also known as Tietze’s syndrome. It can be caused by overuse as the cartilage between the joints becomes damaged. Younger people are particularly affected by this condition, which causes chest pain. Symptoms include chest pain which gets worse or comes on with activity. The pain is felt at the front of the upper chest and is made worse by breathing deeply. Chest pain may also occur when applying direct pressure to the joints. 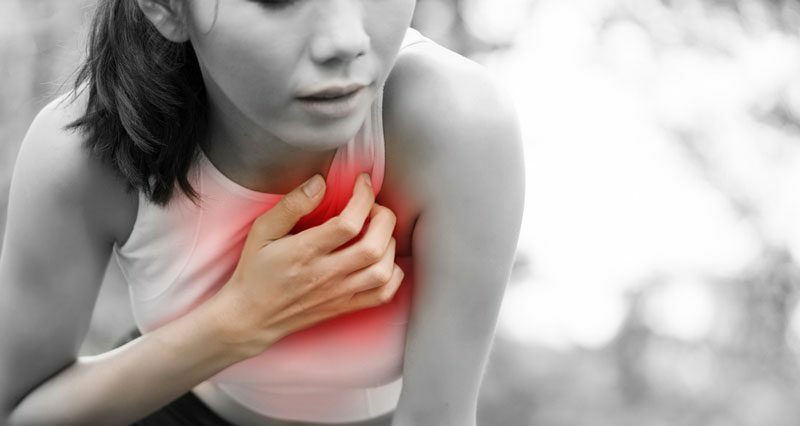 Costochondritis is thought to be caused by overuse, resulting in repetitive micro-trauma. The two bones themselves are cushioned by cartilage inside the joint. It is this cartilage which is damaged and results in inflammation. The intercostal muscles are muscles in between the ribs. A stress fracture of the ribs is rare but has been known in a number of sports including Tennis, Golf, Rowing, and Gymnastics. It is a gradual onset overuse injury caused by traction of the intercostal muscles between the ribs. A side strain is a tear of the internal oblique muscle, often at its attachment to the ribs. The pectoralis major muscle is a large powerful muscle at the front of the chest. It is used to rotate the arm inwards. Its weak point is at the tendon where it attaches to the arm bone. The front of the shoulder will be painful and swell up, and the muscle may have visibly changed. Read more on the symptoms and treatment for this injury. Symptoms of a pec major strain will include a sudden sharp pain at the front of the upper arm near the shoulder where the pec major tendon attaches. There is likely to be rapid swelling of the front of the shoulder and upper arm. Tests which will reproduce pain and help confirm the diagnosis include getting the patient to pull their arm across the front of the chest or rotate it inwards against resistance. A visible gap or lump in the muscle may appear. Treatment: Apply R.I.C.E. (rest, ice, compression, elevation) at least for the first two days. Ice can be applied for 10 to 15 minutes every hour initially decreasing as symptoms reduce. See a sports injury specialist or doctor. A surgeon will operate if it is a total rupture of the tendon. A long rest period followed by a full rehab program is essential. Sports massage can be applied to aid healing after the acute stage. Direct trauma or impact can cause a contusion or in more severe cases a sternum fracture may occur. A bruised sternum, or sternum contusion as it is also known, occurs after an impact to the sternum or breastbone. This most frequently occurs after road traffic accidents, although collision sports and those with hard balls or rackets etc can also impact the sternum. From this injury, the front of the chest will be painful and there may be difficulty breathing.